off-ramp | Why you drive bad?! So, which one should I take? They all go to the same place! The third exit is a fly-over for westbound US290/TX71. 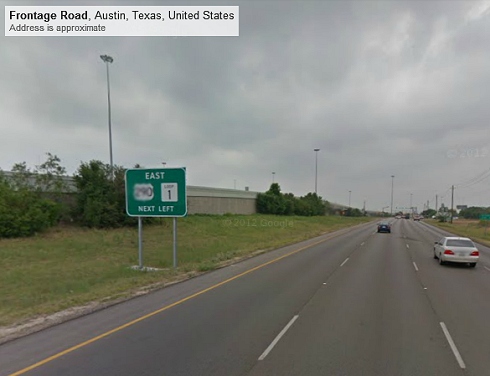 Note that the sign doesn’t indicate eastbound TX71. That particular stretch of highway is both US290/TX71 until it hits IH-35 on the east side of town. 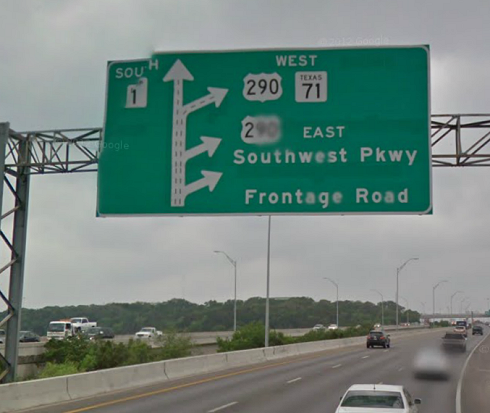 To go onto eastbound TX71/US290, you have to get on the frontage road, cross Southwest Parkway, go under TX71/US290, turn left on the frontage road, then cross Brodie Lane, and then finally hop on the on-ramp for eastbound US290/TX71. What a mouthful, right? Yeah, fk you, you don’t need to get on eastbound US290 anyways. Make up your damn mind! I’m surprised there aren’t more road rage incidents or something to help pacify motorists. This interchanged is all sorts of messed up. 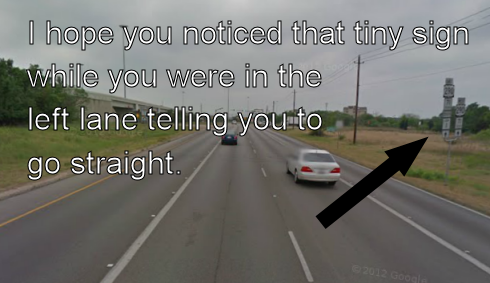 Seriously, TXDOT, WTF?! On my way to the theater I saw a stereotypical douchebag move. I was on the tollway interchange and the two lanes become one on the flyover. Up from behind comes a lifted Silverado on chrome wheels. It was obviously a poser as these were street wheels and tires, not for off-roading. I was about five car lengths behind the car in front of me and I was already past the part of the road where the dash white lines stop indicating the lanes merge. Well, Mr. Silverado driver decides he didn’t want to slow down and be stuck behind me. Not only does he speed up and drives over the painted median to get ahead of me, but he flies past the car in front of me as well cutting him off! He was already well past the point where the two lanes becomes one! Farther down the road he pulls the same stunt when he mistakenly got into the right lane thinking it was an exit lane, but merges back to the highway. Obviously this guy is compensating for something. I’m very amazed that people are able to deal with this off-ramp daily. I guess it’s just one of those “either you know it or you don’t” driving tricks. The first time I was heading south I was expecting a grandiose interchange with elaborate flyovers for all lanes. Well, there are flyovers, just not for southbound I-35. One has to exit US290 onto a frontage road, make a right at the next frontage road, and hop back onto I-35 to go southbound towards San Antonio. 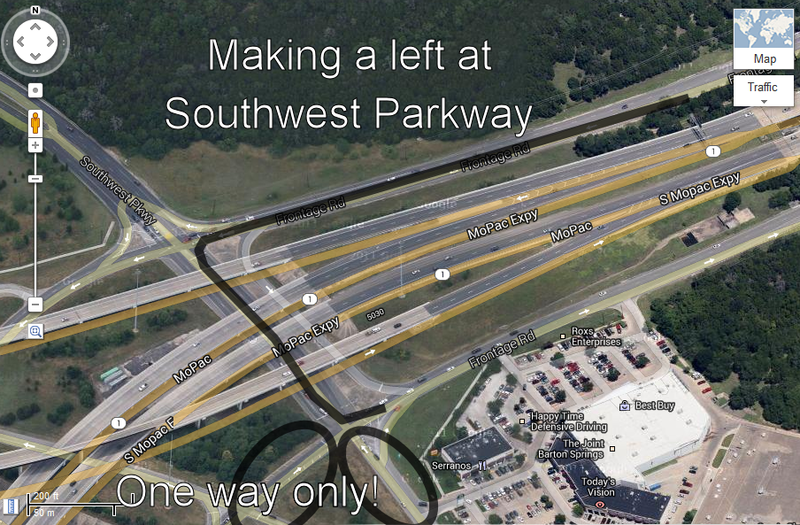 I got to this interchange and flew past that short off-ramp for southbound I-35 and yelled FML not even a nanosecond after I missed it. I exited I-35 northbound, got off at the next exit, and got back on I-35 southbound. Currently, TxDOT is working on flyovers, but who knows when that’ll get done. 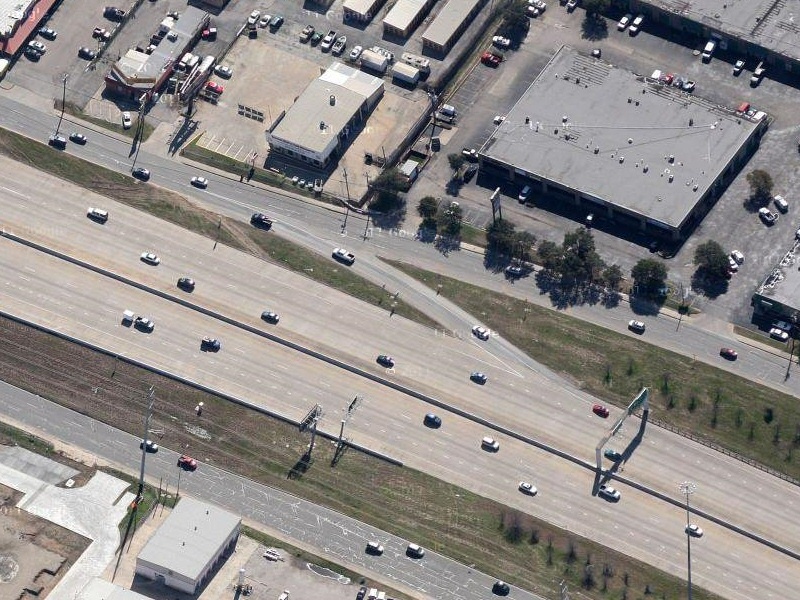 An aerial view of the off-ramp.